As the school year draws to a close, so does the 2017-2018 Music Ministry. This was the most fulfilling year I could have hoped for, and I hope those of you who are with us regularly got to witness their gifts and talents, too. To say I am proud of and humbled by them is an understatement! Anyone and everyone is invited to come up to the choral area and lend their voices at any Mass these weekends! A safe and happy summer to all! How’d you do with last week’s Hymnal Scavenger Hunt? 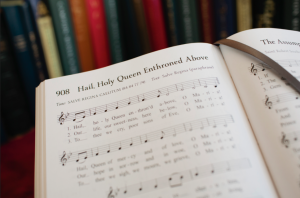 It was Holy, Holy, Holy, found in the green hymnal at #448 and the red hymnal at #483. As we enter back into Ordinary Time, it’s wonderful to think about Creation. This song praises different elements of nature in an energetic way! Hint: This song may be found in the red hymnal.